Valet Pro Paint Cleanser is different to the norm as most paint cleansers will hide and fill micro-marring in your car's bodywork, ours actually removes them. It can be used after claying to really enhance the gloss and metallics of your paintwork and can be applied by hand or machine polisher. Valet Pro Paint Cleanser is different to the norm as most paint cleansers on the market will hide and fill micro-marring in your car's bodywork, ours actually removes them. The whole purpose of the paint cleanse is to deeply clean the paintwork and enhance the paints gloss. It is a preparation product prior to a final wax or sealant. In some cases a paint cleanse is used after claying. It is possible to inflict micro marring into paint work when claying and thus it is important to remove the micro marring, even if it has been caused by the clay or not. A paint cleanse is also a good option if your paintwork is in relatively good condition but has a few contaminates which need removing. A paint cleanse will also clean deep into scratches removing embedded grime that claying cannot reach, thus making these imperfections less visible. 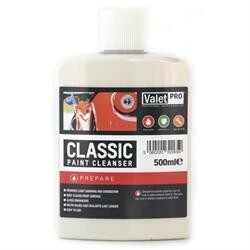 Valet Pro Paint Cleanser has fine polymer abrasives and while most paint cleansers will hide and fill micro marring, our product will remove them. It also has good filling qualities which hide deeper imperfections and to add to this there are additional polymers which gives it a semi-permanent finish thus improving the life of your chosen wax or sealant. Finally it has some impressive gloss enhancing abilities. and these gloss enhancers 'lift' the paintwork and can make metallics pop out. It can be used on its own as a final product or it can be used in a ValetPRO system. Application methods can be either by hand or using a machine polisher (either a DA or a low speed rotary). © Copyright 2019 Juicy Detailing. All Rights Reserved.